Microsoft has deployed a new preview build of Windows 10 (17704) which contains a number of changes, with a good deal of work having been done to the Edge browser, alongside improvements for the Skype app, bolstered security and more. So let’s start with Edge, which has had its appearance smartened up with elements of Fluent Design which is slowly taking over the Windows 10 desktop interface. The browser now has a depth effect for the active tab to help highlight it more clearly. It's a subtle move, but a helpful one. Also, there’s a new Microsoft Edge Beta logo – with the word ‘BETA’ stamped across it in not-so-subtle fashion – to remind testers that the browser they’re using isn’t a finished product and may suffer from bugs. Aesthetics aside, the browser’s Settings menu has been rejigged to put the most commonly used items at the top of the menu, making it generally more easy to use – plus more customization options have been added so you can tailor it better for your own preferences. Speaking of customization, Microsoft has added the ability to choose which icons show in the Edge toolbar. Finally, it’s now also possible to choose your preference as to whether media should play automatically in the browser when you visit a website with a video. That functionality was supposed to make the cut for the last preview build, although it ended up getting dropped – but it’s here now. 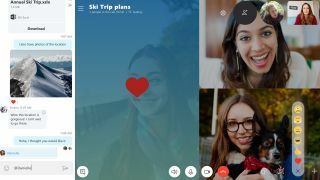 Moving on to Skype, build 17704 has added a few new calling features, including the ability to take a screenshot during a call, plus Microsoft has moved the screen sharing button to a more prominent and easily reached position. More customization is now available for those on a group call – such as deciding who is highlighted on the main call canvas – as well. That comes alongside various interface tweaks such as making your contacts easier to access, and easier to digest to boot, thanks to a new layout. The Skype for Windows 10 client now has new customizable themes, too, as well as various other tweaks to the likes of the notification panel. In other words, there’s quite a lot of work here to make Skype a more streamlined experience. On the security front, under Virus & Threat Protection, there’s a new Block Suspicious Behaviors capability, which leverages Windows Defender Exploit Guard technology to keep an eye out for apps or services which are doing strange things that could be malware-related. Also, the Windows Diagnostic Data Viewer – which shows the telemetry data Microsoft collects from your PC – has also had its interface tuned somewhat, and now allows you to view any Problem Reports that have been sent to Microsoft. In other words, the logs that detail what happened in a crash or other glitch. Further tweaks made include the introduction of a new video playback viewing mode designed to adapt to the current ambient lighting level, and make a video clip more visible in very bright environments. That could certainly be handy for those running Windows 10 on a laptop who use the machine outdoors. The Task Manager has also seen a nifty change in that it now presents two new columns showing the power usage of apps at the current time, and over the last two minutes, so you can see if any applications are draining your notebook’s battery excessively. Finally, new Typing Insights detail exactly how AI has been helping you out with features like auto-correct, for those who use the virtual keyboard. For the full list of changes brought in with build 17704, check out Microsoft’s extensive blog post. The other major point to note here isn’t an introduction, but a removal. Microsoft has ditched Sets functionality – which brings the concept of tabs from the web browser to the wider desktop interface – from Windows 10 with this preview build. That’s potentially sad news, as this means it may not make the cut for the big Redstone 5 update due later this year (if you’re suddenly experiencing déjà vu, that’s because it was also dropped from Redstone 4).